You’ve seen the styles, you’ve witnessed the flawless and and the fails and now it’s time to judge the elite eight. This festive week rounds off the most sartorially inclined and the ultimate fashion faux pas looks of the season. Who will be crowned the ATP Style Seed of 2014? And who will be lauded as a mere pretender in this sport of champions? Kicking off our Elite Eight is Andy Murray. It’s rather unusual for the serious Scot to sport shades so vibrant as neon green-yellow. But alas, he did. And on the red clay courts of Roland Garros, no less. Murray has been wearing the Barricade line all season, and though clay isn’t his most preferred surface, Adidas surely intended to make an impression in Paris. Luckily for them, Murray reached the semifinals, falling to the eventual champion – who else? – Rafael Nadal. The Tour’s brightest new star, Kei Nishikori, scores No. 7 on our list. Uniqlo’s second prodigy via Japanese compatriot Kei Nishikori happened to sport the brand’s more adventurous designs throughout the season. Nishikori’s breakout performance at the US Open featured a classic horizontal striped polo neck and panel shorts combo, and took him all the way to the final. His footwear of choice, the Adidas Barricade 8+ in a slick colorway of grey, silver metallic and black, was a standout component of his New York state of mind. The suave and oh-so lovable Tomas Berdych makes the list at No. 6. A slightly more palatable version of H&M’s Hawaiian shirt eyesore, Berdych tread the lawns of the prestigious Queens Club in crisp and clean navy and white. A classic polo neck with colorful yoke, complete with matching navy shorts, was on the agenda. We still had a little nod to the luau by way of peekaboo compression shorts, ideal for summer pursuits. Ever the crowd pleaser, coming in at No. 5 is Jo Wilfried Tsonga. Brights and darks go hand in hand with ATP fashion. While we probably won’t be seeing an all-neon pink outfit anytime soon, we can at least look to the jovial Frenchman for some style inspiration. A pop of fire red is a shade begging to get attention, and Tsonga is as often an entertainer as a professional. Tsonga’s Adizero CC Feather III‘s also added a punch to the proceedings in solar red and core black. Guns out, fist pumps at the ready, its No. 4, Rafael Nadal. The stomping ground for the King of Clay, Roland Garros serves as a familiar back drop for the ferocious Spaniard. Often looking good in any shade, and I’m sure not many of us are complaining that his shorts are getting, well, shorter and shorter each season. On the dirt this year, Nike premiered the latest release of the Rafa Crew, complete with signature 7-inch gladiator shorts and the new Nike Lunar Ballistic‘s given a zingy update in neon acqua. Edging his way to No. 3 is the man to beat on the court, Novak Djokovic. Japanese sportswear brand Uniqlo have done little to surprise me since they appointed the world No. 1 as Global Brand Ambassador back in 2012. The silhouettes are usually regimented – a familiar polo neck and shorts combination – yet for 2014, the designers pushed the style periphery ever so slightly, incorporating the ying-yang pattern for Djokovic’s Roland Garros attire. Seen here in contrast monochrome shades of black, grey and white, and complete with Djokovic’s signature custom ribbon detailed Adidas Barricade 7‘s, the look stood out brilliantly against the vibrant terre battue. Coming in at No. 2 is Baby Fed, Grigor Dimitrov. 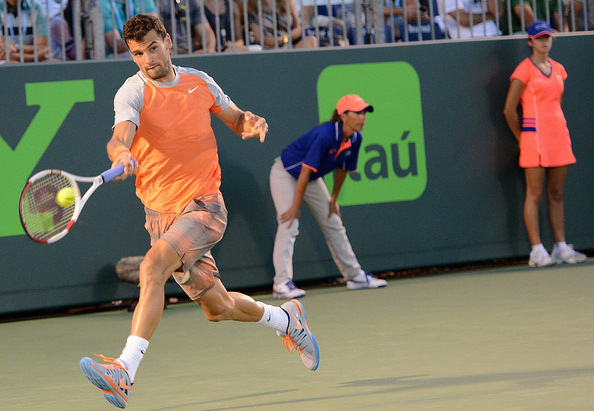 Both on and off the court, Dimitrov is a style experimentalist. As the other half of Dimipova with fellow tennis star Maria Sharapova, it’s little wonder why the Bulgarian has tended to up his style stakes. His gear for the spring American hardcourts vibed this very sensibility, with Nike offering an unusual mix of grey, orange and neon blue, complete with an abstract print. I’m normally not one for over embellishment, but here the combination looked fresh and, most importantly, seasonal. The Swiss Maestro stands alone in the style stakes when it comes to on-court fashion. Topping the Best Dressed list is Federer’s US Open night match attire, an outfit so dark it was aptly given the name Darth Federer. Nothing evokes the drama of New York more than all-black, which Federer embodied with sleek panache. For extra effect Federer’s Nike Zoom Vapor 9.5 Tour‘s arrived night time ready in a shock colorway of black and hot pink. Did H&M forget that Tomas Berdych plays tennis and not football? The Czech wouldn’t look out of place trotting up and down the pitch of the premier league, that’s for sure, but this all-stripe and compression short combo lacked sartorial appeal, however fun it was. Granted, New Balance aren’t the most accomplished sportswear brand for designing tennis attire. This neon yellow tetris print number isn’t the most mind-boggling design I’ve ever seen, but the combination of the mismatching shorts and (mandatory I know) compression arm sleeve, ensure this look is ever off-kilter. For a breakout year, a season that saw an impressive run to the Australian Open title, it’s a little surprising why Yonex didn’t decide to push Stan Wawrinka further in the style stakes. Retro abstract print aside, Stan’s choice of footwear looks more suitable for the sea bed than the tennis court. Lotto’s attempt at graphic interest came by way of a rather amateur looking ombre digital design. And like Stan, Ferrer suffered a similar footwear fate with his ninja turtle green and black numbers.